This short video is a great introduction to the causes driving climate change, and the effects on the earth that are resulting. What Causes Climate Change. National Geographic, Aug 28, 2017. British climate scientist Ed Hawkins has developed a new set of climate visualizations, communicating the long term rise in temperatures for particular locations as a changing set of colors from blue to red. In this image of global surface temperatures dark blue represents very cool and dark red represents very warm. Each stripe represents a year from 1850 to 2017. The difference between the coolest and warmest years is 2.43°F. The four warmest years are the last four. The Earth has already warmed 1 degree Celsius (1.8 degrees Fahrenheit) since the 19th century. In October 2018, a major new United Nations report looked at the consequences of jumping to 1.5 or 2 degrees Celsius. Half a degree may not sound like much. But even that much warming could expose tens of millions more people worldwide to life-threatening heat waves, water shortages and coastal flooding. Half a degree may mean the difference between a world with coral reefs and Arctic summer sea ice and a world without them. Why Half a Degree of Global Warming Is a Big Deal. All the aspects of climate change will have direct or indirect effects on the health of humans and other living creatures. Some of these effects are easy to imagine, and some are less obvious. They will vary, of course, from region to region. A search for "impacts of climate change on health" yields many sites. 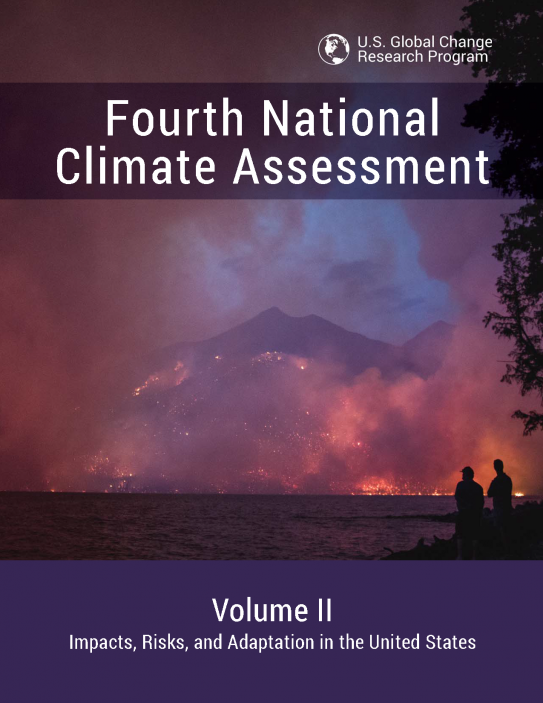 One extremely thorough, well-organized and easy-to-understand survey, "The Impacts of Climate Change on Human Health in the United States: A Scientific Assessment" can be found here. We hear about the impact of hurricanes, droughts and wildfires on the lives and places they destroy. But do we know the financial cost of these disasters? 2018: as of April 6 there have been three weather and climate disaster events with losses exceeding $1 billion each across the United States. 2017: the United States was struck by 16 climate and weather disasters. Each disaster cost at least a billion dollars in damage. The year 2017 now matches 2011 as having the greatest number of billion-dollar disasters. The CCES also reported that loses in 2017 exceeded $306.2 billion, compared to a $214.8 billion loss in 2005. 2012: Damage caused by Hurricane Sandy in 2012 cost $65.7 billion. The drought of 2012, the most extensive since the 1930's, affected almost half of the United States with an economic impact of $30.3 billion. 2005: the cost of Hurricane Katrina reached $148 billion. An October 2018 report from the UN Intergovernmental Panel on Climate Change says what will happen to the world when it gets 1.5°C, or 2.7°F, warmer than preindustrial levels. The report puts the cost of a 1.5°C increase at $54 trillion. The financial cost of climate-change disasters is another compelling reason to reduce our greenhouse gas emissions. Mandated by congress, this report is issued every 4 years and combines the research of 13 federal agencies. In 2015 carbon dioxide contributed 82% of the greenhouse gas emissions in the US. An increase in the number and length of extreme heat events. Increased frequency of extreme weather events. More intense downpours will most likely become more frequent. Annual average temperature in New York State will rise. New York State has an ambitious energy plan: reduce greenhouse gas emissions 40% by 2030 from 1990 levels, and get 50% of our energy from renewable sources. Climate change is a threat not just in New York, but across our nation and around the world. The number of heat waves, major hurricanes and heavy downpours has increased, and the strength of these events has also increased according to the National Climate Assessment. 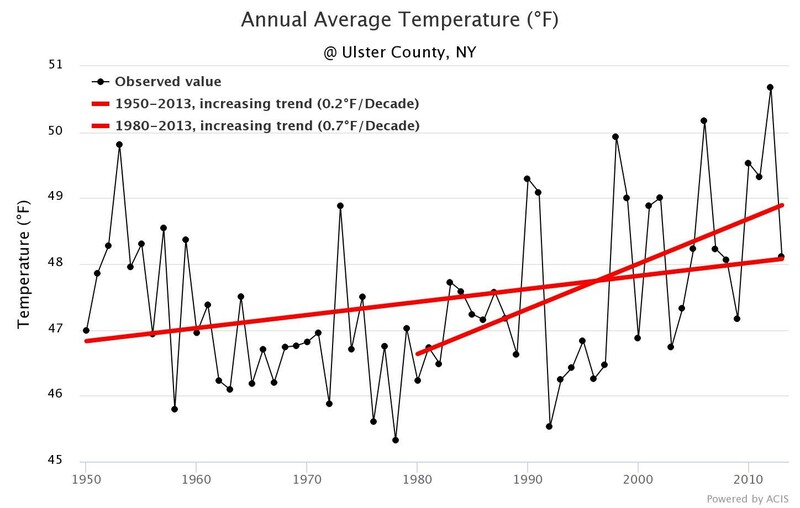 A new tool from Cornell University allows us to see the history of climate change in Ulster County. The Cornell Climate Smart Farming (CSF) Program focused on developing agricultural decision support tools and resources to help farmers better manage the risks of climate change, and it can be used by the layman to determine climate change in local counties; go to www.climatesmartfarming.org. As the table shows, the temperature rose by 0.2 degrees Fahrenheit over 1950-2013, and changed dramatically starting in 1980, where the trend shows an 0.7 degree rise from then until 2013. The year 1989 is generally given as the time when scientists realized that the Earth's climate was changing dramatically because of man's impact on the environment. In creating these tools, the CSF program collaborated closely with the Northeast Regional Climate Center (NRCC) at Cornell University, part of the RCC Program administered by NOAA in the United States. The tools rely on the NRCC-led data through the Applied Climate Information System (ACIS), which is an operational system that provides access to climate data and products to users via web services, and is replicated at multiple RCCs throughout the country. The CSF Tools also utilize daily temperature observations from the National Weather Service (NWS) Cooperative Observer Network, and daily precipitation derived from NWS radar data. 2018 was the fourth-warmest year on record. In a database of more than 3,800 cities compiled by AccuWeather, about 83 percent saw average temperatures higher than normal last year. To see the temperature rise in 2018 in your city, use this interactive page from the NY times.